Owen Ruggiero | The PHOENIX A recent community meeting held in Pottawattamie Park revealed mixed feelings among residents about the dispensary’s proposed location. A company that builds and operates medical marijuana dispensaries in the Chicagoland area, 420 Capital Management, proposed opening a facility in early 2017 in north Rogers Park. If approved by the City of Chicago, the new GreenGate Compassion Center would operate under Illinois’ “Compassionate Use of Medical Cannabis” pilot program, which allows people diagnosed with certain illnesses — including cancer, Parkinson’s disease and PTSD — to apply for medical cards for purchasing medical cannabis. At a community meeting on Sept. 28 in Pottawattamie Park, near the proposed site of the dispensary (1930 W Chase Ave), area residents voiced mixed reactions to Bob Kingsley, the owner of 420 Capital Management, and Ald. Joe Moore (49th Ward). Many residents expressed support for medicinal cannabis and the positive effects it has on patients who have the illnesses included on the State of Illinois’ list. Others were concerned, however, with the location of the proposed clinic. GreenGate Compassion Center would be located at the intersection of Chase Avenue and Rogers Avenue, a few blocks away from the Howard Red Line station. This is a residential area, according to City of Chicago zoning. Kingsley told residents they shouldn’t worry about the dispensary impacting children who live in the neighborhood. GreenGate would have professional security guards on duty 24 hours per day and a large network of security cameras, which would stream video directly to the Illinois State Police. “It’ll be more secure than the bank,” Kingsley said. Kingsley also assured residents that children wouldn’t be exposed to customers smoking marijuana around the facility. Any use or consumption of cannabis would be prohibited on the property, and it is illegal to smoke marijuana in public. Some students, despite not living near the proposed dispensary, understand the concerns expressed by residents. But the biology and math double major also said people should “embrace change” and not be too fearful of medicinal cannabis, since it can be helpful to those with the aforementioned diseases. However, Holden said that she supports the drug policies of Loyola’s Community Standards, which do not allow any possession or use of drugs on campus, including in the dorms. These rules make it difficult for students who live on campus but are allowed to use medical cannabis by the State of Illinois to do so. “I don’t agree with Loyola’s drug policies,” said Loyola student Rory McPeak, 21. McPeak, who is also the president of Loyola’s chapter of Students for Sensible Drug Policy, called the rules set forth in the Community Standards “harmful.” Many of these rules, however, are the result of federal drug policies, according to the senior economics major. 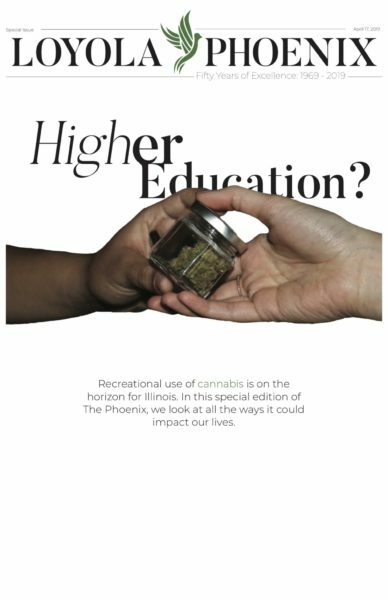 Despite the campus-wide ban on medical marijuana, students who meet the criteria set forth by the state would still be able to purchase it. “If they have a card, simply, they can get a hold of the medicine. If they don’t have a card, they can’t get into the [dispensary] building,” Kingsley said. Kingsley offered no solution as to how or where students would be able to use the cannabis once they purchased it, given the restrictions of Loyola’s policy. I have cancer apendicial metastatic adenocarcenoma and it is stage iv how do in get a card so I can get medical marijuana? Here’s some info from the State of Illinois. Alderman Joe, It is illegal for you and Robert Kingsley to be in cahoots and tell him to go ahead and open a cannabis dispesary before the zoning board of appeals approves it.What kind of kickbacks are you getting from the criminal Robert Kingsley who has already lost his bid to try and open in Rogers Park in Alderman Silverman’s area.Joe should be booted of of politics. Concerned citizens, contact the chicago zoning board of appleals, Blake Selected or Robin Kingsley(rmith365@cinci.rr.com). We are all for medical cannibis and dispensaries. -just not the criminals who will rip you off with inferior product and over priced goods and services.Dont let them cool you or take advantage of you.There are many legitimate places you can go to who are honest!!!! These false comments about Mr. Kingsley and Alderman Moore are shameful and irresponsible. We are talking about a facility that is going to offer an alternative medicine to those suffering from debilitating pain. The clientele will be very sick individuals that have exhausted all other avenues of pain relief and are turning to medical cannabis in hopes of getting their lives back. Please, keep your personal agendas to yourself and think of the greater good.